Our emotions seem to rule our lives.It feels as if we are their slaves? On our emotions it depends whether we are happy or sad, angry or at peace. How can we understand these, are they our friends or foes? What is their root –are we indeed delivered to them ? are we their slaves? Understanding them, how they arise and how we can channel them, helps us so that they can become our friends on the journey to become truly human and use our potential to walk to the highest goals of life. Der Workshop wird auf Englisch abgehalten. Swami versteht (und spricht) aber auch Deutsch. Wenn jemand Fragen an Swamiji lieber auf Deutsch stellen (und beantwortet haben) will, ist das auch möglich. In addition to lectures there will also be time for guided meditation and Q&A. 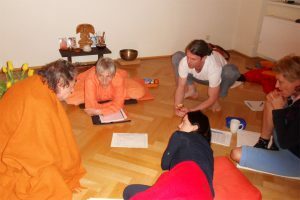 Interessierte können in diesem Workshop von Swami Nityamukatanda auch ein persönliches Mantra erhalten. Diese Mantra Initierung findet in zusätzlichen Einheiten an diesem Wochende statt. 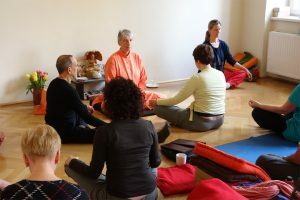 Voraussetzung ist eine besetehende regelmäßige Meditationspraxis und zumindest ein Besuch eines Workshops mit Swami Nityamuktananda in der Vergangenheit. Wer Interesse an einem persönlichen Mantra hat, bitte SCHNELL ANMELDEN, denn es ist nur eine sehr beschränkte Anzahl an Initierungen möglich. 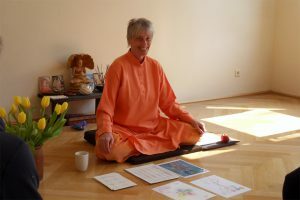 Swami Nityamuktananda Saraswati (Dr. Christa-Maria Herrmann), German by birth, naturalized British, lives in the far west of Cornwall. Although she originally studied Theology her university studies soon expanded to Education, Psychology, Philosophy and Art and Design (Ceramics). Different teaching jobs (in colleges and universities) in various countries followed; as well as extensive travel and study in Asia, Australia and America (Taoism, Zen and Tibetan Buddhism and various indigenous spiritual paths). Deep involvement in Meditation and the practice of Sattipahana (mindfulness) finally led her to Yoga and Vedanta. She worked with several great spiritual Masters among them Zen-Masters, great Siddhas, the Tibetan Lama and Tulku T.Y.S. Gangchen, the great Yogi Swami Maheshananda, H.H. Swami Anubhavananda (Supreme Acharya of Vedanta) and Mandeleshwara Swami Veda Bharati. In 1997 she made her Doctorate in Eco-philosophy on the subjects of the Mahabhutas (Five Great Elements) and has since contributed world-wide in conferences and workshops especially in the two areas of ‘the Five Elements’ and Yoga Philosophy in its widest sense. These include international congresses on World Peace (UN) and complementary Medicine. Presently she gives workshops on various aspects of “Yoga philosophy” and meditation Retreats. In 1997 she was awarded a ‘World-Peace Prize’ for contributions to World Peace (LGWPF/ NGO of UN). Subject to alterations. Minor changes to the schedule are possible. Any changes of the time table will be published here. Dieser Workshop ist für alle, die in Yoga weiter wachsen wollen. 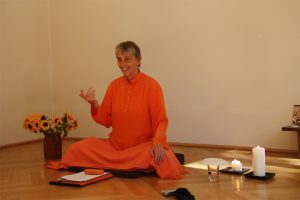 die Kontrolle oder Kanalisierung von Emotionen ist die Grundlage jeglicher Yoga Practice (citta vrtti nirodah). Aber natürlich ist dieser Workshop auch für alle Nicht-Yoga-Praktizierenden, die einen besseren Umgang mit ihren Emotionen erlernen wollen.